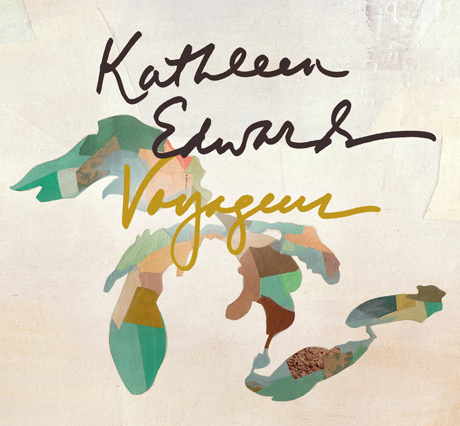 Last month, we learned that "Change the Sheets," the B-side to Kathleen Edwards's recently released "Wapusk" single, would also be appearing on her forthcoming, Bon Iver-produced album Voyageur. With the vinyl single out now, Edwards has revealed the rest of the details to the new LP. Voyageur will come out January 17 on MapleMusic. Marking the follow-up to 2008's rootsy Asking for Flowers, the record finds Edwards describing it as being different than other entries in her back catalogue. Namely, this time around she let others join in on the writing process. "I knew laying the foundation for this record would start with the songs," she said in a statement. "For the first time, I was open to the idea of co-writing, and what had previously been an intensely private process became a challenge to see what would happen with an open mind to a different approach." In addition to co-producing the set with Edwards, Bon Iver main man Justin Vernon contributed backing vocals, guitar, piano, organ, bass, banjo and xylophone to Voyageur. The album also features guest appearances from Francis and the Lights, Norah Jones, Stornoway, John Roderick, Phil Cook (Megafaun), Sean Carey (Bon Iver), Afie Jurvanen (Bahamas) and Brian Moen (Peter Wolf Crier). Edwards is also joined by her longtime backup band. You can check the tracklist below. As previously reported, Edwards is currently out on the road with Bon Iver. You can check the dates here. 3. "A Soft Place To Land"
5. "House Full of Empty Rooms"